Neera is collected every morning just at sunrise. 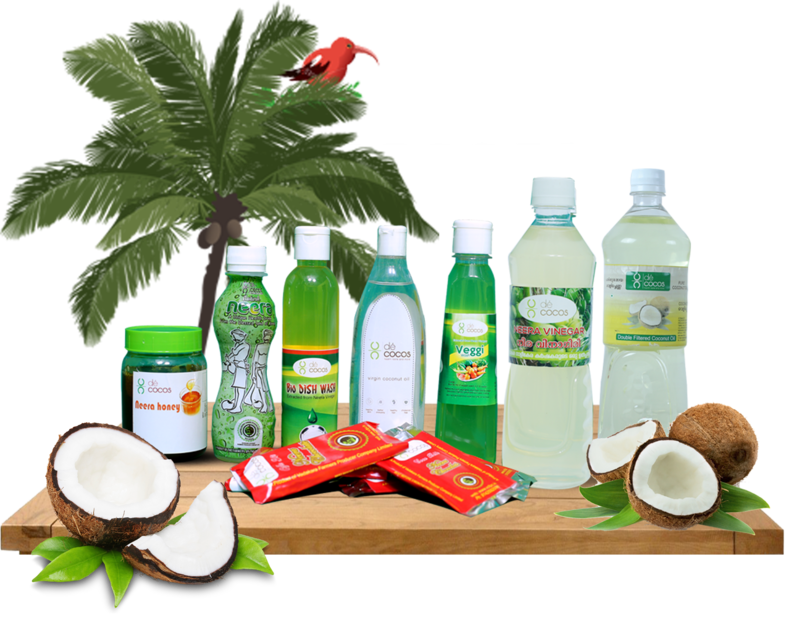 The sap is extracted and collected by trained technicians.the sap is collected from the cut flower of the coconut. A sterilized container is fastened to the flower stump to collect the sap. The white liquid that initially collects tends to be very sweet and non-alchoholic. Neera thus collected is brought down from the top of the palm in containers and filtered through a fine mesh cloth. Neera collected as above contains all the constituents of a cool and healthy drink with food,mineral and medicinal value. It keeps the human system cool and improvesdigestion. Fresh Neera as it trickles from the palm, is easily susceptible tofermentation and hence permitted quantity of anti fermentation agent need to be added for preservation. Neera thus obtained is delivered to our Neera Processing Unit at the earliest.In the Processing Unit it is first passed through a centrifuge for removing the sediments present and thereafter subjected to pasteurization to preserve its natural form and increase shelf life. Neera thus processed is filled in Poly Propylene bottles in the hot condition. 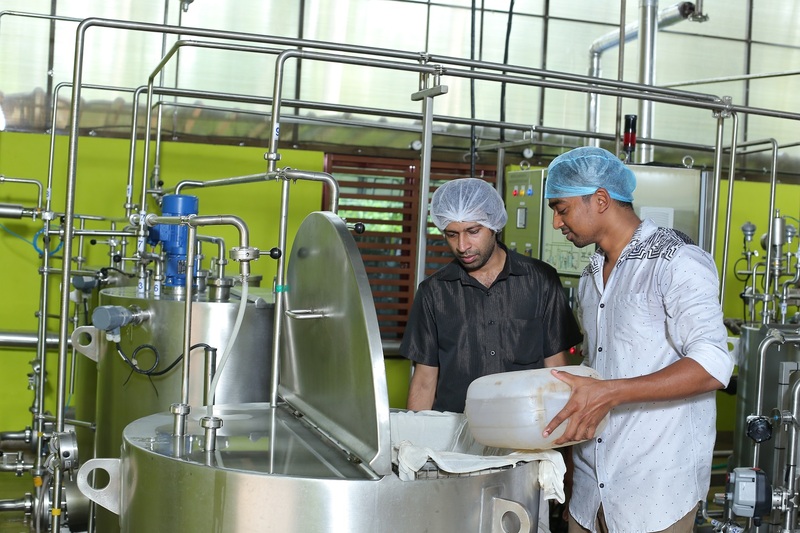 The plant established by VCFPCL at Chemmarathur has Centrifuge and Pasteurisation Unit supplied by Alfa Laval. The Processing Unit is spread over an area of 37.88 cents. The plant is equipped with a 100Kva generator to cater to uninterrupted power for plant operation. The plant is also equipped with machinery for preparing the following value added products from Neera. Neera converted into a solid or a semisolid crystalline mass ready for direct Consumption is called Neera jaggery. Neera jiggery is made by boiling raw coconut sap In large shallow round bottom vessels. The raw juice is heated at in a pan and this juice is then delimed to neutrality. Boiling of the filtered juice is done over open improved furnaces. After allowing the gur to set for some time, the same is removed from the moulds and packed. The quality gur is always hard, crystalline and golden colored. Neera is extensively used in the preparation of chocolates. 5.Neera Vinegar: Fresh sap is poured into large containers with clean netted cover toallow aeration and prevent entry of dirt and foreign objects. After about ten days fermentation in well ventilated room, the sap can be harvested as vinegar. Vinegar has extensive use as preservative inpickle industry and flavouring agent in food processing sector. Neera vinegar has good export potential as compared to the synthetic vinegar. 6. Neera sugar : Neera sugar has a polarization value of 96° to 98% The initial process of sugar making is practically the same as that of jaggery. In this case also, juice is delimed, filtered and boiled. Chocolates, toffees and confectionery items are made with Neera sugar.